Tarsal tunnel syndrome -- tarsal: meaning the lower ankle area of the foot -- is a condition that usually affects the medial (inside) aspect of the ankle. There are many structures that run through this area, including tendons, veins, arteries and nerves. Tarsal Tunnel Syndrome occurs when the posterior tibial nerve, as it courses under the ligament at the ankle, becomes inflamed for a variety of reasons, namely: excessive pronation, arthritic problems such as rheumatoid arthritis, trauma, and even obesity. When entrapment compresses the nerve, it causes pain, a burning sensation, and tingling on the sole of the foot. This pain usually worsens as the day progresses and can usually be relieved by rest, elevation, or massage. Diagnosis of Tarsal Tunnel Syndrome is made by physical exam and the patients history of their complaint. A history of gradual and progressive burning on the bottom of the foot should alert the doctor to the possible diagnoses. Physical exam will often reveal a flat foot or over-pronation of the foot that is observed when the patient walks. Observation of the area just below the ankle bone on the inside of the ankle may reveal a slight swelling. Tapping with the tips of the fingers or a neurological hammer in this area may reveal a tingling sensation in the bottom of the foot. X-rays may be of little value, because they will not show the nerve or reveal any evidence of soft tissue masses. X-rays may be useful in determining the extent of pronation of the foot but only if the x-ray is taken with the patient bearing full weight on the foot. An MRI may reveal the existence of a soft tissue mass, but will not demonstrate any damage to the nerve. Nerve conduction studies will reveal if there is damage to the Posterior Tibial Nerve, but will be negative in the early stages of the condition. People with exceptionally flat feet can develop tarsal tunnel syndrome because the flattened arch causes the muscles and nerves around the ankle to change their route slightly, compressing the tibial nerve. In other cases, compression results from a cyst in this area. Systemic diseases such as rheumatoid arthritis and diabetes also can cause the syndrome. 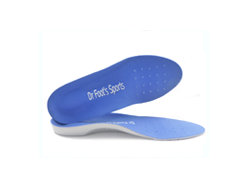 Conservative treatment such as arch supports and wider shoes may successfully relieve the discomfort of tarsal tunnel syndrome. If inflammation of the nerve is causing the compression, nonsteroidal antiinflammatory drugs (NSAIDs) may be prescribed. Steroid injections also may prove effective. 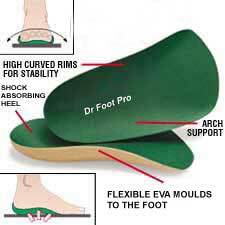 If the problem is caused by flat feet, custom orthotics can help restore the foot's natural arch. 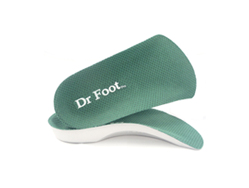 Dr Foot Pro Insoles can have a immediate effect on the pain associated with this condition.